Right now I’m holed up in a darling little cabin with a fire roaring in the fireplace, a glass of wine on the coffee table, one of Joanna Vaught’s Christmas playlists streaming (which can we talk for a moment about how genius they are?! ), and, obviously, a computer on my lap. I mean, what cabin getaway doesn’t involve computers these days? For all the talk of needing to disconnect, I’m kindof loving having wifi up here (not to mention cable to watch all the games yesterday…poor Steelers…sigh). I’d imagined that this recipe would make it to the blog before Thanksgiving and would be a “perfect salad for your Thanksgiving table” kind of thing. But, um, let’s go with a detox salad, if you will. Well, not “detox,” but “eat good real food” salad. You know what I mean. I’m actually looking forward to spending this holiday season in more of a mindful eating pattern, inspired by Monica’s Clean project. I’m not sure if I’ll follow the diet 100% (smoothie, regular meal, soup/smoothie) but I know that I’m in dire need of a refresh for my gut & mental health. Plus, why wait till January? We’ll see if I can pull it off for December though. But! This salad! It’s very simple, full of amazing, local vegetable goodness, with a simple balsamic-garlic dressing. Add some candied pepitas for crunch, and you’ve got a filling dinner-sized salad for any meal, be it Thanksgiving, Christmas, or just a not-sad-desk-lunch. Because no one needs a sad desk lunch. No one. Peel the butternut and cut in half length-wise. Scoop out the seeds and then cut the squash into 1/2″ dice. In a mixing bowl, combine the butternut squash with the olive oil and spices. Toss to coat the squash completely, then transfer to a parchment lined baking sheet. Arrange squash in a single layer and roast for 15 minutes. Flip the squash over and roast another 10-15 minutes, until tender when poked with a fork. Remove from oven and set aside. In a small skillet, combine the pepitas, vegan margarine, and turbinado sugar and heat over medium-low until the pepitas are candied. Transfer candied pepitas to a piece of parchment paper to cool. Set aside. Meanwhile, in a small blender, combine the grapeseed oil, balsamic vinegar, garlic, and sea salt to make the vinaigrette. Blend to combine. 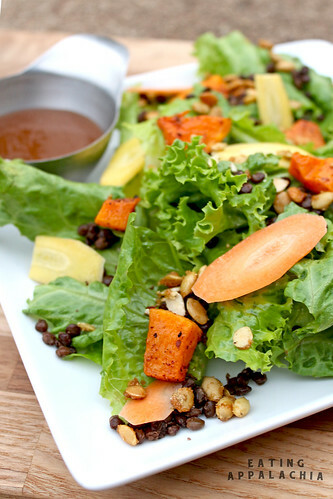 To compose the salad, toss the lettuce, carrots, cooked lentils, and butternut with the vinaigrette. Sprinkle the candied pepitas on top and enjoy! this is certainly not a sad desk salad! i actually have been loving butternut squash and lentils lately, so this couldn’t be more perfect. i’ve been enjoying warm foods lately, but this is perfect when i want something a little lighter. Sumac! Yay! Mr. Wing-It bought me a jar of sumac for Christmas last year (he bought me spices I had never tried before – he knows me so well) and I love it. This salad looks fantastic and I don’t know why I have never combined butternut squash and sumac before. Thanks for the recipe! PS: Enjoy your cabin getaway! Hi Jes, I’m so touched by the mention and it couldn’t be more timely for me, too. I’ve been thinking a LOT about the holidays – I’m going to Chicago for a month and this has historically been a challenging time for me, health-wise. So one of the reasons I’ve been so gung ho on “clean eating” and “juicing” and all that malarkey is that I’m trying to get PSYCHED to keep up with these better habits throughout my travels. Knowing someone else out there is going for the same REALLY helps. Maybe we can support each other in this – not sure how… but I like the idea of a Healthy Christmas Club (or something that sounds less lame). Yay vegetables! I definitely feel the need for more after Thanksgiving dinner–even though there were certainly plenty of vegetables on the table there. And it’s definitely not the end of the road for squash, right? We have the entire winter to go! This looks so good! And that clean eating program sounds right up my alley. Soups every day? Don’t mind if I do!